The name "Africa Twin" alluded to the great Trans-African endurance rallies, though the Africa Twin was not actually derived from the remarkable NXR, which won the Paris-Dakar rallies of 1986-88. 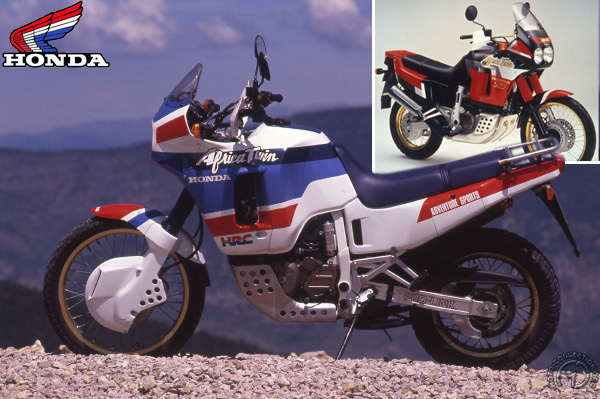 The first production off-road twin offered by Honda in 1987 was the 600 Transalp touring machine, a far cry from the two-wheeled desert ships which competed in the African rallies. The following year, the Africa Twin 650 eventually appeared. The Transalp was closely identified with the racing NXR. It retained the 52-degree V-twin with three valves per cylinder and liquid cooling. However, the strong sump shield, large fuel tank, twin headlamp, aluminum swing arm and its broad-shouldered stance signaled that here at last was an authentic desert bike. In the course of various updates, this machine's displacement was increased from 750 to 1000cc and many detail improvements were made. It became a point of reference in the large-displacement, twin-cylinder, off-road category. Having demonstrated its great capabilities in Africa during the Paris-Dakar marathon, the Africa Twin became a prime choice as an effective grand touring machine that handled well, was reliable and was comfortable. Its highly flexible engine and well-balanced cycle components made its rider oblivious to the size and saddle height that had been bred on the tracks across the Sahara. High, heavy and handsome, the Africa Twin rode as well as it looked. The original show model of 1988 set the style for the 1992 version (inset).